You stated that, per the Revolutionary Pension records of Charles Peyton, that his heirs were the children of James Peyton. Please recheck your records on that, as the heirs of Charles were his own children (Thomas, Valentine, and Nancy/Ann), not the children of his brother, James. You are correct here Bill and I thank you for showing me this. The information I have under Charles Carter PEYTON regarding his revolutionary war pension, actually belongs to the other Charles PEYTON of the same age in Stafford County, and if I remember correctly, that Charles PEYTON had no heirs and it was his brother’s children who were his heirs. I think that when I wrote the book, I had not found that Charles or thought they were the same Charles. I will need to look at both pension records of both Charles PEYTONs to sort this out. I never looked at the Charles Carter PETYON pension – didn’t know there was one. Incidentally, although my book does state that the wife of Evan PEYTON was Anne CARTER, I do not have any proof of the CARTER name and would no longer go with that in an updated book. I remember how difficult it was to sort out all of these PEYTONS of this area with all the James, Charles, George and Ann names. The Peyton Society gives the lineage as Charles, son of Evan, son of Charles and Diana, son of Philip, son of Philip and Mary (Rush), son of Henry. Your book gives the lineage as Charles, son of Evan, son of Philip and Diana, son of Valentine, son of Henry. Actually, although I probably was not as clear as I should have been in the book, I have Philip PEYTON as a “possible” husband of Diana, (page 51) and therefore “possible” father of Evan PEYTON. I made the assumption that others would see that relationship, but I should have spelled it out. Evan PEYTON is a proven son of Diana. I found no proof of the husband of Diana except that he was a PEYTON. I found Philip to be the “presumptive” husband which I explained in the book. I know other researchers have her husband as Charles PEYTON and her maiden name as “EVANS”, but I never found any proof nor presumption of any of that, so I went with my research here, instead of what others wrote. I continue to stand by my conclusion that Philip PEYTON is the presumptive husband of Diana, mother of Evan and James PEYTON. Elizabeth Rush, married Joshua Hudson, and had a son Caleb Hudson who apparently married a Miss Peyton of this line. Since Caleb left a long line of descendants named “Valentine Peyton Hudson”, Caleb’s wife was likely a daughter of Valentine Hudson. With the common practice of marrying first cousins at that time, one would normally assume that Caleb’s wife was a daughter of Philip Peyton and Mary Rush, but in the case of Philip not having any children, his closely associated nephews and nieces would then be the closest contacts of that line to the Hudson descendants of Elizabeth Rush. I am sorry not to be able to follow this, as I have no information on Elizabeth RUSH, other than that she was a sister of Mary RUSH who married Philip PEYTON. I know nothing of Caleb HUDSON who married a PEYTON, nor how Caleb’s wife could be a daughter of a Valentine HUDSON, nor of Philip and Mary PEYTON. I have never have written that Philip and Mary (RUSH) PEYTON had no children. I wrote that he “possibly” had no heirs. I also wrote that, although I believe the Philip and Charles who were devisees of his estate were probably nephews, they could have been sons (page 23). In fact, in my book I mention a possible daughter that I cannot prove. I have no sons listed for Philip and Mary because I never found any that I could accept as sons, however, the old records are very fragmented, and because I found no sons, does not mean he had no sons. My research and calculations would not allow me to accept Valentine PEYTON as one of his sons, even though others do. I explained all of my calculations and my conclusions about this line in my book. You may be correct that Caleb HUDSON’s wife was a PEYTON, but I have no documentation to show that and I have not done any research on the HUDSONS. I will get to your other comments as soon as I can research them. Thank you very much for purchasing my book. 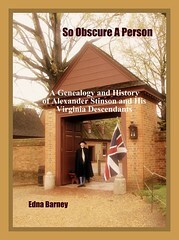 The corrections that I have made thus far are published here: https://neddysnook.wordpress.com/peytons-along-the-aquia/ . You have given me so much to digest that it will take some time to review it all, but I will. If I come to agreement with you, I will correct my writings at the above site. 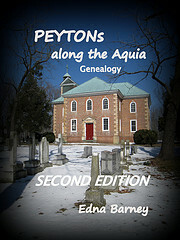 I have since the publication of the book discovered some new history of the PEYTONS which I hope to publish someday. Meanwhile, I will take a look at what you have uncovered. It indeed sounds interesting. I will respond here at this site. Thank you so much for publishing your wonderful book on the Peyton’s. Question – on page 143, you list two children for Thomas Peyton and Sarah Maddox. Bill Deyo sent me an email sometime back suggesting that Thomas and Sarah had at least two other children – Anne Carter Peyton and my GG Grandfather James Henry Peyton. James Henry Peyton married Lucy Monteith and they had at least one child, my G Grandfather, Simeon Thomas Peyton, who married Sarah Katherine Grigsby. They had several children including my Gandmother Eva Peyton who Married Ernest Lee Stoffregen of Fredericksburg. Among their children is my mother, Freda Lee Stoffregen who married my father Roy Martin, Sr.
No, on page 143 of “PEYTONs Along the Aquia,” I list only one known child for Thomas and Sarah PEYTON. The other children that I mention are “possible”. I can now verify that James H. PEYTON and Simeon C. PEYTON were children, as they appear on the 1850 Census with Thomas and Sarah. It is likely that there were other children, besides the ones I have found. Perhaps Mr. Deyo can supply his sources for the other children. Although, I cannot verify this about Sarah MADDOX, it is said that her parents were Basil and Margaret (NAILLE) MADDOX of Charles County, Maryland. There was another James H. PEYTON who married Lucinda and ended up in Missouri. Could he be your ancestor? I don’t know who his parents were. It would indeed be nice to be able to sort out these PEYTONs from the Fredericksburg area. Many were named James and Charles.